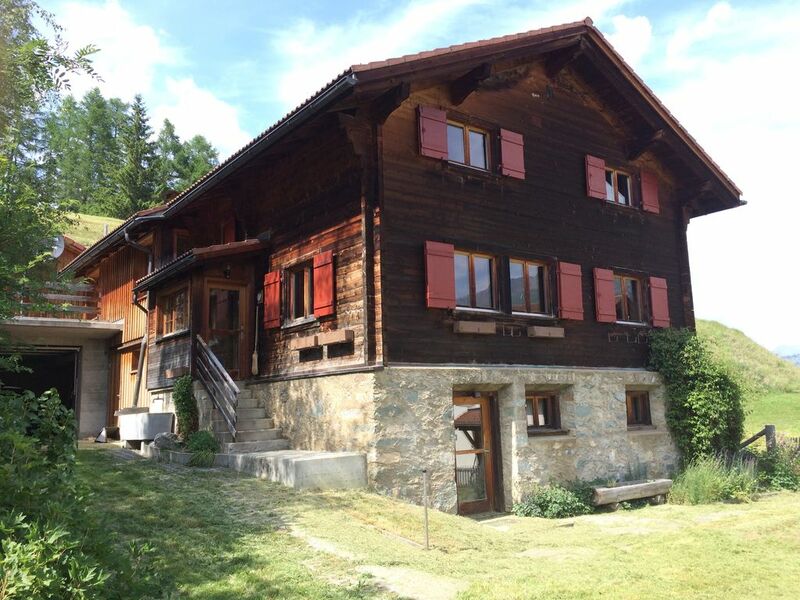 Classic Swiss Farm House nestled in a traditional farming hamlet at an altitude of 1500 metres. The interior is a balance of classic Alpine tradition and rustic chic. The chalet sleeps 8 with an additional children’s bunk-bed, and makes for the perfect mountain escape, both for those looking for ski and hiking adventure or those simply wanting a relaxing break. The large spacious sitting room provides ultimate comfort and alpine style, with antique toboggan coffee table, sheep skin topped stools, and traditional wood burner, it makes for a wonderful ‘apres ski’, relaxation, reading, gaming and pre-diner drinks room. Vintage ski posters, leather chairs and antique pine cupboards complete the traditional stylish ambience within the bedrooms. Two of the four double bedrooms have the option to change to twins. One wooden cot and two travel cots available. Guests have access to the entire Chalet. The ground floor (double bedroom, shower/WC, and bunk room) is not internally connected to the main chalet. There are two bathrooms (one with bath the other with shower). The dining room features a large English oak table with comfortable beech chairs, adorned with brass candle stick holders, antique pine furniture and traditional wood burner, along with a plentiful array of fondu sets to cater for larger parties. The kitchen is simple and well equipped to cater for any number of guests. Its wood burner/stove adds alpine charm and authenticity for those mid-winter ‘stove-prepared’ hot chocolates. Electric hobs and oven are available for conventional catering. There is a large lawn at the front of the house and two terraces at the rear. There is ample parking for a number of cars in the driveway with a 1x car garage available as well. There is a separate ski room with boot dryer. In the winter months my neighbour will pre-heat the chalet prior to guests arrival. There are two large and two small wood burners and several free standing electric heaters, no actual central heating. This means you will have to keep the fires going. Firewood is available and included in the price and is kept undercover in the driveway. The chalet gets lovely and warm. The hamlet of Wergenstein is situated in 370 sq km of the outstandingly beautiful ‘Beverin Nature Park’ which is also home to the majestic ibex. Wergenstein offers excellent access to a vast area of superb and exciting ski touring and hiking trails. It is within a 40 minute drive to the world famous resorts of Lenzerheide (now connected to Arosa) and Flims – both in excess of 220kms of ski runs. A 20-30 minute drive will get you to three small but simply delightful family orientated resorts; Tschappina, Sarn and Splugen. There are a number of popular marked toboggan runs throughout the Shamserberg and one run directly from the our village. Wergenstein has a Bus Stop and is accessible by public transport in the Summer and Winter, and is an excellent starting point for mountain bikers, ski tourers, and hikers. In the summer months there is excellent alpine fishing in many surrounding rivers, dams and high altitude lakes – your host will be happy to share his passion and local knowledge to get you started. Mountain biking, boulder climbing (The Magic Wood – most famous bouldering field in Europe - Ausserferrera) can all be worked in to your itinerary. There are plenty of wonderful swimming destinations from wild lakes to swimming pools. Your choice will include remote icy-cold high altitude lakes to fully serviced, child friendly, crystal clear emerald blue lakes in the vallies (e.g. Caumasee, Flims). White water rafting adventures are also available in the Upper Rhine with tours taking you through the highly dramatic Rhine Gorge. Within a 40 minute drive you can be teeing off from two heavenly situated Golf Courses; Alvaneu Bad Golf Course and Lenzerheide Golf Course. Chalet Nidus Montis is 2.7 km from the famous Via Spluga hiking route (Thusis to Chiavenna, Italy). Stop at the Andeer Aqua Spa before returning from a day’s downhill skiing, ski touring, golfing or mountain biking, and treat yourself to a hot spring soak, sauna and massage. The Capricorns Hotel (30 metres from the Chalet) offers a first rate restaurant and a fun lively bar. Das Haus hat uns sehr gut gefallen. Wir haben unseren Aufenthalt sehr genossen. Die Hütte ist sehr geräumig und lässt keine Wünsche offen. Auch als grosse Gruppe sind wir bestens untergekommen und haben uns alle wohl gefühlt. Ausserdem waren Ankunft und Abreise sehr unkompiziert und die Kommunikation sehr freundlich. Wir kommen auf jeden Fall gerne wieder! We had a great holiday in this house with a family of 6 during the summer holidays. Although the weather was not ideal, the house provided so much space we could also spend good quality time inside when needed. All the amenities are available and you can order fresh bread from the nearby hotel. From the house you can do all kinds of activities; go even further up and walk to up to 3000 meters of go down and visit towns in the valley (great shopping at Chur, only 40 minutes away) or go swimming in the beautiful lakes in this area. The local caretaker is also very nice and helpful as well as the communications with the owner. Would recommend to anyone, especially large families or groups. Es hat alles gepasst! Für eine große Familie ideal, viel Platz, gut und geschmackvoll eingerichtet. Sehr ruhig und ländlich. Dogs by request only, and only allowed in specific rooms.